Apple TV is some what new to me and my class but we are starting to really love it. We use it regularly with my personal laptop as a way to skype without cables and cords. Nothing beats being able to move the laptop around the room and REALLY share what's happening outside our window with our friends. We've been using it with iPads too. Here one of my students is reading from her book which she made in My Story. 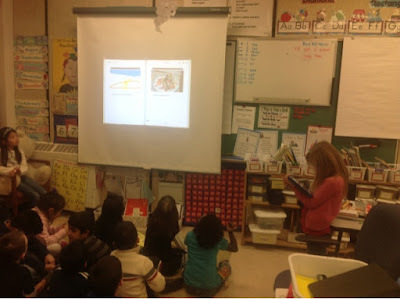 It was super easy for the class to see her pictures, and she just gleamed as she read her story to the class. Are you using Apple TV in your classroom? I'd love to hear how you are using it. Karen, I don't think I've ever posted on your blog so it's about time I did! WWW.MRHONGSCLASS.COM'S TOP TEN LIST FOR USING AN APPLETV IN THE CLASSROOM! Having an AppleTV in a progressive learning environment is a must. 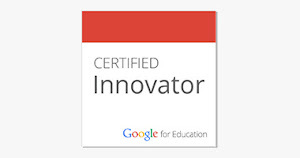 It further enhances the 4 C's of 21st Century learning: Communication, Collaboration, Creativity, and Critical thinking. I have personally been using an AppleTV for about 3 years now so everything I do with it is from personal experience and practice and thinking of progressive and creative ways to use it in the classroom. 1.) If you have mountain lion installed on your macbook or imac, you can mirror what's on your computer directly to your projector through your AppleTV. You can mirror anything from your computer directly to your screen wirelessly! 2.) Students can display their work wirelessly directly from the apple products. In other words, they can display their work from their iPads right from their desks. It eliminates any need for adapter cables and saves time. It takes about a second to throw up your work to the AppleTV. 3.) Keep your Class YouTube account logged in so that you can easily access your videos, playlists, favorites, etc. It has become our digital video library. It has virtually eliminated the need to visit the library to take out any vhs/dvd. Having all my fav videos a click away is seriously awesome! The same goes for Vimeo accounts. 4.) Awesome for classroom management because you can mirror whatever you are showing to your students while you walk around the class to ensure student engagement. 5.) Integrate the Apple Photo Stream so all photos from all mobile devices (Class iPad, iPod, iPhone, etc) are uploaded automatically. During the learning process, we take images and they are basically instantaneously displayed on our screen. Our screen is on all day long and the students love seeing the learning that has taken place. 6.) Communication with parents - Again with the Photo Stream, invite/add all your parents and students (who have signed the media consent forms) to each individual photos stream. In other words, create albums for each event, learning task, etc so everyone can see exactly what is going on in the classroom. Parents and students love this! It will take a bit of leg work, but it is well worth it and you will receive unbelievable feedback from parents. It makes the 'LEARNING' visible and it provides all stakeholders with a window into the classroom. You can also do similar things with a FlickR account. 7.) It's like a jumbo-tron at a Canucks game. You can enable all students in the class to see a close-up view of whatever it is you are doing. From science demos to using math manipulatives in class. We did this today in class. My student teacher did a demo for Science and we threw a live stream of the demo to the screen so the students who were too far from the demo table could see exactly what was going on. 8.) Eliminates the need for a separate document camera. Why buy one when you have an iPad, AppleTV, and projector? Just airplay a worksheet, picture, etc. 9.) Radio stations - It seems like there is an endless number of radio stations on AppleTV. You can access music from different cultures from all over the world. 10.) PodCasts - Accessible for free. Tons of great PodCasts out there. Ryan, you're a rockstar. Seriously a rock star. I have questions for some of the things you are doing with Apple TV. I'll be in touch. I get #1 (I don't have mountain lion but AirParrot works great on my personal laptop - hoping the district one is updated soon), #2, #4, but have no idea how to make the other aspects work. I do most (3, 9, 10, and have class blog for 6) of the things you mention but do them through an iPad or laptop and just display via Apple TV. I'm obviously missing something here - which is why I've written this blog post. #7 makes me curious - besides what I'm creating on the computer or iPad how else can I make it work like a document camera ( which I have and love but would be curious to see how Apple TV becomes one). Looking forward to hearing from you. 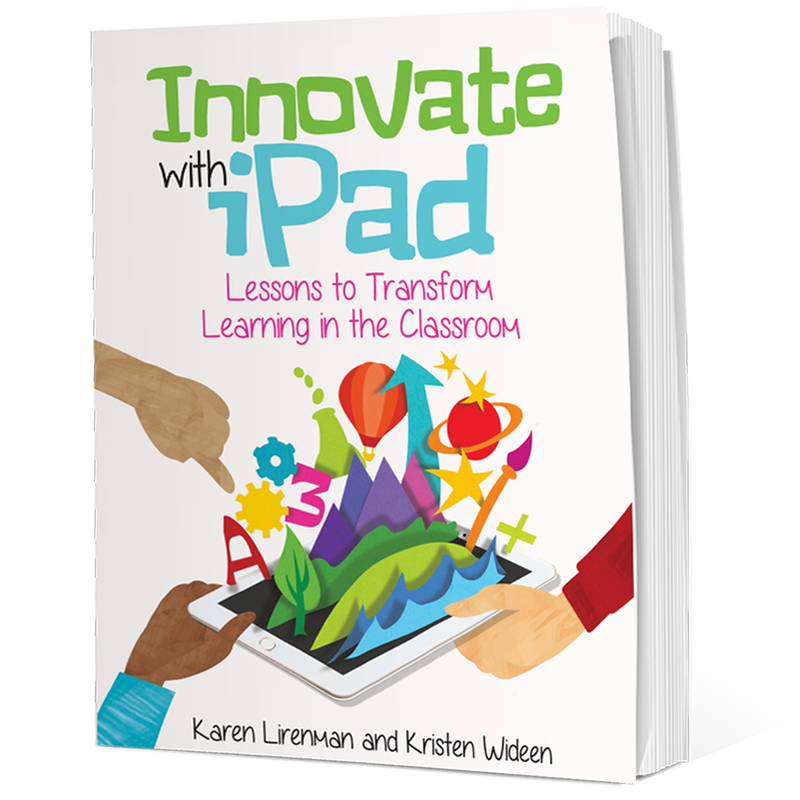 Thanks for always sharing your learning so openly, Karen! I am also just beginning to scratch the surface of Apple TV in my classroom and am very intrigued by some of Ryan's ideas! Especially #5 and #7 - I definitely need to explore the photo stream concept and the "replacing your document camera!" Here's to sharing learning in progress! So for #5, have your parents/students input their itunes accounts from your class iPod or iPad. The great thing with the most recent itunes/Apple update is you can access the photo stream albums from any computer. It doesn't have to be a Mac. This is brand new info since it wasn't available on PCs previously. The only images they will be able to see are the ones you create in a separate shared Photostream folder. It's great and the parents love it. It supplements the visible learning that they see on our class website www.MrHongsClass.com Just remember to make sure you have had all your students sign their media consent forms. #7 - Set up your iPad to mirror to your projector. Use a Gorilla grip stand or jerry rig one with some textbooks so the video camera is pointing directly at the area you want to show on your whiteboard/projector screen (JUMBO-TRON as I like to call it). This way, your live feed will show up on the screen via the AppleTV. Does that make sense? Great for when you do Science Demos and use math manipulatives. We're loving our AppleTV's as well! BoardCam app + TwelveSouth's HoverBar + iPad + AppleTV = document camera and so much more. Pop the iPad into the HoverBar, launch BoardCam, and you're ready to rock and roll. I have a great document camera which is right where our projection device is so even if I had portable document camera the reality is we are at the screen if we want to see what's happening. Due to plugs etc my screen is not in the centre of my room. Something to think about that. I wish I had a ceiling mounted projector, but I guess I can hope that in time I'll have a mounted TV and I will no longer need the projection device. It will all be wireless. Hmm. Head spins. Thanks for your advice Garth. I'm digging the Hoverbar. A little pricey but sleek! Wow! Reading your and Ryan's descriptions of Apple TV is amazing! I sure am missing the boat on the capacity of Apple tv in the classroom. I've got some serious learning to do. I usually use it to mirror the iPads as students work with them. I'm frustrated with connecting it and then disconnecting it to get back to the smart board though. Thanks for sharing Karen! Oh my goodness! I am completely blown away! I use Apple TV at home but never thought about using it in my class! The comments from Ryan are so helpful. I would love to try and implement this in my class! It's interesting Ryan, I keep reading what you wrote over and over again and I"m not completely sold. I think it has more to do with the fact that i DO have a great document camera, and I DO have a laptop that allows me to parrot what's on it through apple tv. I have you tube play lists too but you don't need apple TV for that. What I'm curious about is whether the videos in my playlist play any better from apple tv direct to my screen then through my computer via apple tv to the screen. Hmmm. Thanks for being so awesome Ryan.